One thing I look for in an animated film is the cast. *Pop singing sensation (the smash hit "Friday") Rebecca Black in her first feature film debut. 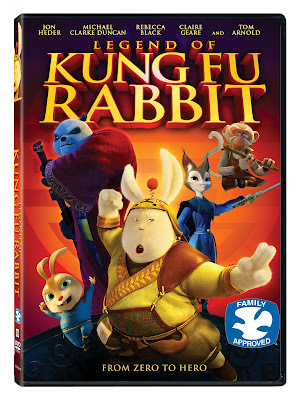 This story is about a rabbit Chef named Fu (Jon Heder). Fu is a dopey but very sweet rabbit that works in a kitchen making sweet cakes. Fu finds himself in a situation and making a promise to the Kung-Fu Master, Sifu (Tom Arnold ). Fu promises Sifu that he will go and find Sifu's daughter Penny (Rebecca Black). When he find's Penny he must return the martial arts academy tablet to her. Fu does not know Penny nor does he know why it is so important to get this tablet to her. He just knows that he has made a promise he must keep. So Fu leaves his kitchen and baking sweet cakes, to head out on a journey to find Penny and her funny little sidekick Biggie (Claire Geare) After a long search he finally finds out who Penny is. Once he has found her Fu, Penny and Biggie set out on a heroic and exciting quest to defeat Sifu's arch nemesis, Slash (Michael Clarke Duncan), to save the Kung-Fu Academy that Slash is taking over. Fu must help Penny defeat Slash and take back her father's academy. Are they successful in getting back the Academy? Well I can't tell you the ending now, can I. This is a fun show for the kiddos! This movie is filled with adventure and fun characters. Enter to win a DVD now! Stopping by for the contest. We love Family-friendly entertainment. Thanks for hosting. Sounds like a fun movie! Thanks for sharing!! I'd like to see how this compares to Kung Fu Banda!